Last week King County, Washington, became the latest municipality to sue the oil and gas industry in an effort to extract monetary damages for climate change. Like San Francisco, Oakland, and New York City, King County hired the Seattle-based plaintiffs’ firm Hagens Berman to represent it. Curiously, even after facing heavy skepticism and criticism of its past lawsuits, Hagens Berman doubled down on some of its weakest arguments, and in doing so, may have thrown its fellow plaintiffs under the bus. It’s an accusation opponents of the oil and gas industry have made before, but it now serves to cast doubt on the lawsuits brought by King County’s fellow climate plaintiffs in California, who recently released a report that praises their own efforts to emphasize the uncertainty of climate projections. It could also create additional legal headaches for King County and other plaintiffs. In January, one of the defendants of these climate lawsuits filed a petition in a Texas District Court suggesting that the California municipalities’ claims of climate damages were either exaggerated in their lawsuits or downplayed in their municipal bond disclosures. The U.S. Securities and Exchange Commission (SEC) was later asked by the Competitive Enterprise Institute and National Association of Manufacturers to investigate the municipalities’ bond disclosures for possible securities fraud. As Energy In Depth noted at the time, the former SEC official’s report was almost certain to cause headaches for the plaintiffs’ lawsuits, whose very premise relies on the idea that these municipalities have already been harmed by climate change and that the energy industry was inappropriately acknowledging the same uncertainty noted by the municipalities. So when ExxonMobil acknowledges the uncertainty of climate projections, it’s “clear misdirection.” But when San Mateo, Santa Cruz and Marin Counties and the Cities of Imperial Beach and Santa Cruz do the same, they were acting appropriately? That is a textbook example of hypocrisy. It is also clear that Hagens Berman has not updated the language in its lawsuits to reflect recent events. In fact, much of King County’s complaint is copied over from the San Francisco and Oakland complaints, with minimal alteration. 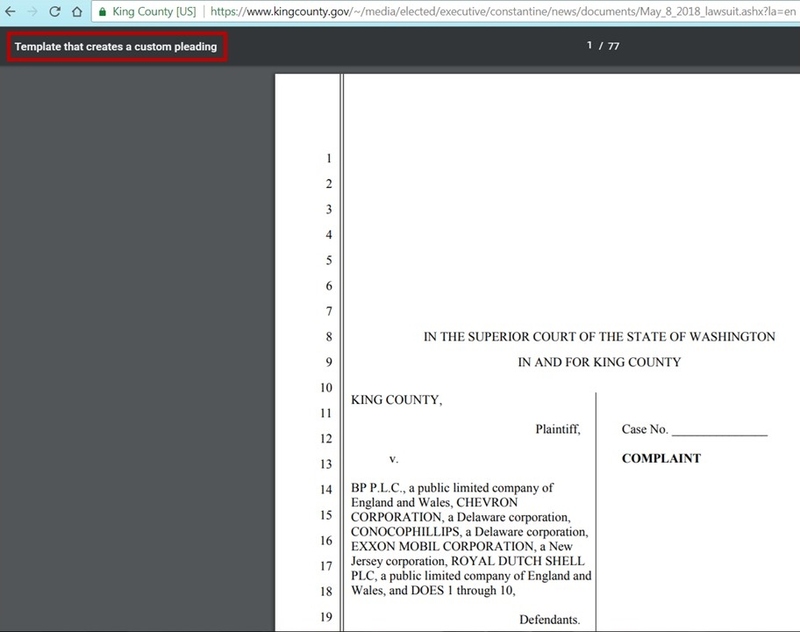 The copy of the complaint available on King County’s website is even titled “Template that creates a custom pleading,” providing some of the strongest evidence yet that Hagens Berman is shopping these lawsuits as an off-the-shelf deliverable. The firm stands to make tens of billions of dollars in contingency fees should any of the plaintiffs find success in the court room. But the firm’s inattention to detail and its history of bringing “baseless” cases that give a “new meaning to ‘frivolous’” – as one judge put it – may ultimately prove a legal headache for the firm and the cities and counties it represents.